Can you believe it? Another Phoenix summer is already upon us. It is just three more weeks until the summer solstice! Put on your rain slicker because monsoons are approaching. This month, I talk about upcoming events and how you can leave a lasting impression building our community while you bask in the cool of our new air conditioner. Thanks to you, we now have a brand-new section in our bylaws. We as Humanists came together to state loudly and proudly that we will not tolerate poor conduct toward our fellow humans at our events. Thank you for voting for progress and fair treatment. You can read the current version of the bylaws here. I have some sad news. After nearly 18 years of dedicated service, the old air conditioning system finally gave up the “ghost.” Fortunately, it failed just before summer really kicked in and we had time to replace it. Please take a moment to give a huge thanks to Joe Blankenship, our Property Director, for getting the unit replaced with a more efficient and–most importantly–a working unit. Give him a high-five. Thanks, Joe! Each year, we Humanists come together as a community to have a little bit of fun. Every October we pick a magical night in which we celebrate–in tongue-in-cheek style–his noodly-ness, the Flying Spaghetti Monster. Carbing up for the winter anti-hibernation, we feast upon delicious pastas, salads, and desserts in celebration of not just what we do not believe, but also in what we do believe. We believe in doing good for goodness’ sake, but also we also believe in enjoying the fortunes awarded to us in this life and sharing those fortunes with good friends and family. But we also like eating pasta and dressing up like pirates! Well, some do. But this is just one such event. Our major annual event is the celebration of the Winter solstice. Just as our ancestors have for hundreds of thousands of years, we gather on the longest night of the year to celebrate the return of the sun, our great fusion reactor in the sky. We celebrate with food, song, and story. Together, we cherish our common nature that brings us closer to each other and reflect on how the next year can be even better than the last. In all seriousness, these events are a big deal and we need your help to make them happen. We’re putting together planning committees for each event. You, too, can be part of Humanist Society history by planning two unforgettable nights. If you’re with us and can contribute a little bit of time to helping our community grow and thrive, sign up to help plan the event. It doesn’t matter how long you’ve been with us, our veteran members will guide the process allowing you to make deep and meaningful contributions to an event that means so much to our community. We can’t coordinate these events alone. We need your ideas and talents! Join our one or both planning committees today by emailing pam.heward@hsgp.org. Pam is our wonderful and talented Program Director and she’d love to have you. Don’t wait, sign up today! Speaking of events, many of you have been enjoying our Let’s Geography series in which, at each event you pick a exotic or relatively unknown place on this planet. With a target selected we scour the vast knowledge of humanity to share a piece of this interesting locale and its people, culture, food, and history. The Let’s Geography events, hosted by our own Teresa Cokl, are quickly becoming one of our most popular events. They are so popular, that an encore is being requested. We hear you and it is our great pleasure at the Humanist Society of Greater Phoenix to present to you “Let’s Eat Geography!” A tasteful adventure into new and unique cuisines based on the locations and cultures chosen for the Let’s Geography events. Not only can you stuff yourself into another culture, you’ll be able to literally taste it, too. Be on the lookout for our next “Let’s Eat Geography” and join Teresa and her crew on a culinary stay-cation. See you there! In the meantime, sign up for our next geography event on Meetup! 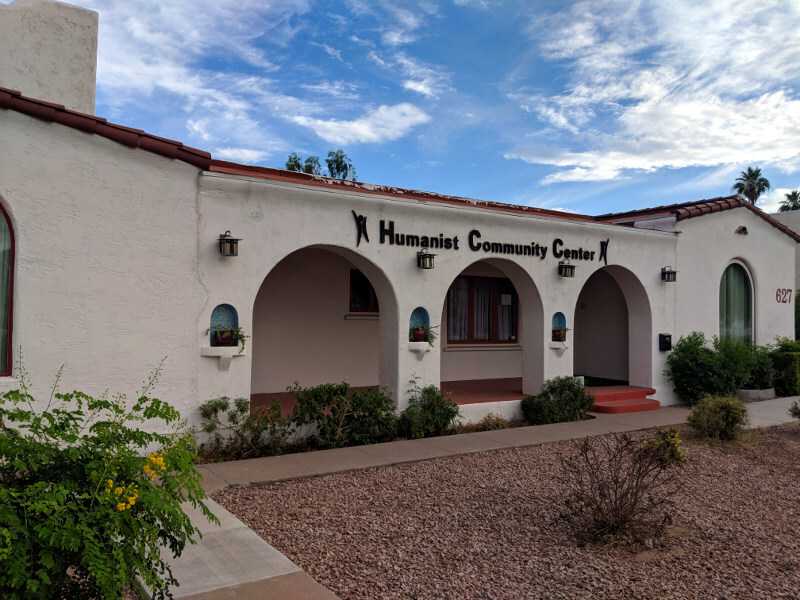 We are doing so many things at the Humanist Society of Greater Phoenix and it’s making a real impact in our community. Each week, we receive phone calls asking about our secular SMART addiction support group works or how someone can get help with addiction or how they can help their family member suffering from addiction. Our ever-enlightening and engaging Humanities Projects bring the light of art and creativity into our lives. Game nights provide momentary relief from our otherwise fast-paced lives. Anita’s crocheting mats for the homeless brings real relief to those in need. Our Sunday Speakers provide unique and deep thoughts to ponder. We are proud to provide a place that enriches the lives of our members and provides a sounding-board for new ideas and growth. However, we need you to keep us going. Just a few dollars each month can help us stay on mission and bring Humanism to the world. With your help, I believe #humanismHeals. Please consider funding us with a monthly sustaining contribution via our new Patreon page. If you’d rather donate once, you can always use our online donation form. Your donations are also tax-deductible. Every dollar is important no matter the amount. If you can afford it, your donation is always appreciated and goes a long way. If you cannot afford to make a monetary donation, we could always use volunteers to help us contribute to the community and sometimes a pair of hands is worth more than a few dollar bills. Please consider helping us at our next work party or volunteering event. Thank you for believing in us! Wear your sunscreen and portable air conditioner and have a fun June!